I am very fond of food blogs. I love cookbooks and books about and with cooking, and I love writing too - and then I'm a Pagan too, who loves myths and legends - and Goddess. I think this is a great opportunity to combine it all. Jana was an ancient Roman moon Goddess. She is the "foremother" of both Juno and Diana - these two better known Roman Goddesses were born with dividing Jana into two, and adding Hera to one part and Artemis to the other. Jana had two faces, just like her husband Janus - and she could see everything. Her animal was the peacock, with hundreds of eyes in its tail. 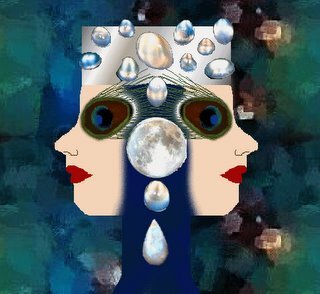 Jana, as the moon Goddess, used also moon as her eyes, and all the reflecting surfaces, water, shining metal - mirrors. Mirrors are sacred to Jana. At New Year people did a lot of mirror magic, and the most popular entertainment at the change of year was scrying. Jana, the Goddess who sees all, was the Goddess of divination as well, and scrying from water and mirrors are her gift of vision to those who honor her.